Last Saturday morning, I met a man named Agnan Adnidihad. Now I’d like you to meet him, too. A few months ago, he was a 62-year-old repairman working in Mosul, Iraq — a Syriac Orthodox Christian quietly tending his business and saying his prayers. Today, Agnan is a refugee, living in a corner of Amman, Jordan, where all he can do is survey the remnants of a life that has been ransacked and left in ruins. I met him at the Italian Hospital in Amman, where he is being treated for heart ailments and stress. He agreed to a short interview; the hospital’s medical director, Dr. Khalid Shammas, served as our translator. You can watch the video below. Dr. Shammas told us the needs of people like Agnan are great; many who pass through the hospital’s doors suffer from posttraumatic stress and depression. And their numbers are growing in Jordan. The country is being flooded with tens of thousands of people from Iraq and Syria who are literally running for their lives. In Jordan, they are finding their way to the Italian Hospital for treatment. The Italian Hospital is Amman’s oldest medical facility, dating to 1926. The 100-bed hospital maintains a longstanding charitable tradition, providing some of the best care at low prices — in some cases, as with Nevine’s delivery, for free. The hospital offers checkups, intensive care, pediatric and maternity care and a variety of other services, making referrals only in the case of the most serious procedures, such as cardiac surgery. “For many years, refugees have been coming to our hospital, starting with the Palestinians,” says Nassim Samawi, administrative director. Now, as many as 130 Iraqi Christians daily seek medical assistance at the white limestone facility in Amman’s bustling downtown. Refugees driven from neighboring countries and continents alike come for help, including people from Syria, Sudan, Somalia and even Iraqis still displaced from the 2003 war. “The flow of refugees is great. We see the suffering they are going through and how we can support them,” says Sister Elizabeth Mary, one of the Dominican Sisters of the Presentation of Mary who staff the facility. When our group of newswriters and bloggers visited, the waiting rooms were crowded with mothers with small children and the elderly in wheelchairs. Young nurses shuttled from room to room tracking patients, collecting samples and filing paperwork. The overwhelming majority of patients and staff were Muslim; the women’s heads were covered in the traditional cloth hijab. Many spoke little or no English. But for all that, the hospital remains distinctly Catholic. Every room has a crucifix on the wall. In the neonatal unit, images of the Virgin Mary with the baby Jesus watch over slumbering newborns. Two sisters from India, Sister Elizabeth and Sister Vinitha, from the Dominican Sisters of the Presentation of Mary, supervise the staff. The work being done at the Italian Hospital is urgent — yet in our short time there, all we saw was calm. The hospital is spotless. The staff is efficient and gracious. You have the sense that all who come there are in the very best of hands. For so many, these are the only hands reaching out to help them. The Italian Hospital has a unit dedicated to caring for newborns, many born to refugees. It was a great privilege to see the work CNEWA is helping to make possible in this corner of the land we call Holy — and I was proud to be a part of it, even in some small way. There is so much good being done here. Grace is everywhere. You, too, can share in this work, and make the lives of men like Agnon Adnidihad better. Take a moment to visit our giving page. You will be giving something beyond what you may realize — a sense of possibility and promise, of reassurance and hope. These people from Iraq and Syria need that. Now, more than ever. 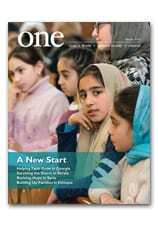 Read more about the hospital in Finding Sanctuary in Jordan in the spring edition of ONE. If you were looking for a figure representing the diversity and religious harmony of Jordan, you couldn’t do much better than a man who was born in Gaza, was raised a Quaker, married a Muslim, and now serves as the mayor of the capital city of Amman. I did Monday night — along with the other religious bloggers and writers who are touring Jordan this week at the invitation of the Jordan Tourism Board. The mayor agreed to give us some time to talk about issues facing his city and his country. So a little after 6 p.m., we boarded our bus and made our way to Amman’s imposing city hall. We were ushered in through security and up a winding stairway to a large conference room. And there we suddenly saw the mayor: an elegant figure with a shock of white hair and a trim moustache, greeting each of us at the entrance to the room, shaking our hands, making chit-chat and asking us where we were from. We took our places around a large square conference table. The mayor’s communications staff also joined us. Dapper, warm, talkative, effusive, the 64-year-old mayor is the very model of modern major politico. He’s also a born diplomat. When one of our bloggers asked him which cities in America he liked the most, he slyly worked his way around the room and extolled the virtues of every home town of every writer at the table. Raised and educated in the Hashemite Kingdom of Jordan, he obtained his High School Diploma and the London General Certificate Examination at the American Friends Schools (Quaker) in 1959. Mr. Biltaji graduated in the summer of 1962 with a degree in education and joined the Arabian American Oil Company (ARAMCO) the same year. In the summer of 1969, Mr. Biltaji returned to Jordan to join the National Carrier ALIA, the Royal Jordanian Airlines as a senior management officer. In his 28-year distinguished airline career, Mr. Biltaji served in different capacities, the last of which was senior vice president. In February, 2004, His Majesty King Abdullah II appointed Minister Biltaji as His Majesty’s advisor on Tourism Promotion, Foreign Direct Investment and Country Branding. In November 2005, he was also appointed as a member of the House of Senate, where he served as chairman of the Tourism and Heritage House Committee, and member of the Foreign Relations and Education Committees. You would think the mayor of a major world capital would have better things to do than chat with writers after business hours on a Monday night. But for over an hour, Mayor Biltaji — in between extolling the virtues of his city and selling it to all those in the room — entertained questions on a number of topics. At the conclusion, he wished us well and thanked us for coming to his country — and for helping to tell its story. He acknowledged that many people misunderstand Jordan and don’t realize that in a corner of the world rife with turmoil and terror, the Hashemite Kingdom remains stable, modern and secure. Again and again he attributed that to the leadership of the king, and what the mayor called a sense of “acceptance” of many cultures and faiths. I think we all left the meeting wishing nothing but the best for the mayor and the land he so clearly loves. In comparison to the storms raging around it, Jordan is a sea of tranquility. Let’s pray it stays that way. The Middle East needs more Jordans — and more cheerleaders for the region like Akel Biltaji. Cardinal Timothy Dolan, Bishop William Murphy and the CNEWA team wrapped up their journey to Jordan on Wednesday. In Kerak, they stopped by the Italian Hospital, administered by the Comboni Sisters. CNEWA has supported the hospital’s renovation and expansion, bringing health care to countless families. As do most Jordanians, the Christians of the Kerak area express pride about their tribal past. But nostalgia for the old days is hard to find on the Kerak plateau. For generations, these villagers have struggled to achieve a better life, a fight that often has meant leaving behind tribal customs. Now, young and old have their eyes fixed firmly on the future. They want to talk about the Internet, not about camels and sheep; about college degrees, not tents and traditions. The only vital thread weaving together their present and past, and one they speak about eagerly, is their Christian faith. According to these villagers, the church — Greek Orthodox and Latin and Melkite Greek Catholic — has held the community together and served as a bridge to modern society. After visiting Kerak, the team traveled to the Christian Bedouin village of Ader to celebrate a First Communion liturgy at the Melkite Greek Catholic Church of St. Gregory. After that, it was back to Amman for the trip home. You can find more about this pastoral visit at Cardinal Dolan’s blog and at the blog for Bishop William Murphy. The complete Journey to Jordan is also archived here. And if you’d like to be a part of the exciting and meaningful work we’re doing in Amman, Kerak and Ader, check out our giving page. Our CNEWA team — board chair Cardinal Timothy Dolan, board member Bishop William Murphy and president Msgr. John Kozar — continued their pastoral visit to the Hashemite Kingdom of Jordan and discovered the “keys to the kingdom,” its wonderful and generous people. An important stop yesterday was the convent of the Franciscan Missionaries of Mary in Amman. From their home, the sisters offer Christian refugees from Iraq and Syria counseling, schooling, formal catechesis and emergency assistance to those in dire need. The sisters’ “House of Mary” also offers a safe haven, a refuge from the storm that has enveloped these innocent families. ...For a few short hours, the participants leave behind their worries and gather the strength to move forward despite the seemingly impossible and unending challenges in their lives — at least for one more day. That’s the warm and supportive atmosphere that greeted the CNEWA team yesterday. The sisters and the families they are privileged to serve welcomed their visitors and made them feel right at home. Later, they celebrated Mass together and had the opportunity to share stories, and even a few laughs. It was a meaningful and emotional visit for everyone. To find out what you can do to support the good work of the Franciscan Missionaries of Mary in Jordan — and extend that “loving embrace” of Christ to others — visit our Jordan giving page. They also paused to enjoy the view at Mount Nebo, where tradition holds Moses viewed the Promised Land he was never able to enter himself. Jordan is home to a mosaic of biblical places. For example, near the Zerqa River, Jacob wrestled the angel and received the name Israel. At Mount Nebo, Moses looked upon the Promised Land. The Prophet Elijah ascended to heaven on a chariot of fire from the Jordan River’s eastern bank, which also later served as the center of John the Baptist’s ministry. These holy places, coupled with the country’s arid landscape, drew thousands of early Christians, such as St. Mary of Egypt, who led lives of penitence and prayer. Their monastic cells, caves, chapels and tombs in turn became important venues of pilgrimage for generations of Christians, who traveled along a well–beaten circuit from one site to the next for much of the first millennia of the Christian era. Today, these sacred areas draw considerable numbers of pilgrims and tourists each year, but less traffic than one might expect. Most of the locations receive scant publicity and are overshadowed by better–known holy sites in Israel and Palestine. And, until recently, some of the most important sites in Jordan have been long lost or neglected. The CNEWA team next headed to meet with the Franciscan Missionaries of Mary, who are providing support to Iraqi and Syrian refugee families, especially young women. More on that part of the visit tomorrow! Meantime, you can read more about their visit at Cardinal Dolan’s blog and at the blog of Bishop Murphy. Some high-profile visitors this week are getting a first-hand look at the work CNEWA is helping support in the Hashemite Kingdom of Jordan. The chairman of CNEWA’s board, Cardinal Timothy Dolan, and board member Bishop William Murphy are making a pastoral visit to Jordan with CNEWA president Msgr. John E. Kozar. The team stopped by Mother of Mercy Clinic in Zerqa this morning, where they were welcomed by the Dominican Sisters of St. Catherine of Siena. After seeing some of the remarkable work being done by the sisters, they headed on to the Italian Hospital in Amman, where they received a tour of the facility operated by the Dominican Sisters of the Presentation and stopped by the ward caring for Jordan’s tiniest patients, newborn infants. Both these facilities are dealing with some extraordinary challenges right now, as the tidal wave of refugees from the Syrian civil war threatens to overwhelm the country. Jordan is on the brink of a health care crisis. The tiny kingdom’s aging health infrastructure has long been in need of an overhaul, but recent events in the region have exacerbated an already-difficult situation. The economic boom that Jordan experienced after the U.S. invasion of Iraq in 2003 has come to a grinding halt. Capital and investment have fled, and jobs are scarce. Economic stress tends to cause people to fall back on public health care services, but the government has been facing a budget crisis of massive proportions. Rounds of austerity measures have increased the price of fuel and basic goods, pounding hard an already weary population. Exacerbating matters, in the past decade Jordan has absorbed massive waves of new refugees — first from Iraq and now Syria. Since early 2011, more than half a million Syrians have found refuge in a country with a population of barely more than six million. Hundreds of people arrive every day, many of whom come with severe injuries, long-term health issues or both. Many women arrive pregnant — some of whom, married at a young age, are barely more than children themselves. And many find their way to institutions like the Mother of Mercy Clinic and Italian Hospital, supported by the generous benefactors and donors of CNEWA. We’ll be hearing more from this Journey to Jordan over the next few days. Meantime, please keep these travelers — and the many good people they will be visiting — in your prayers!